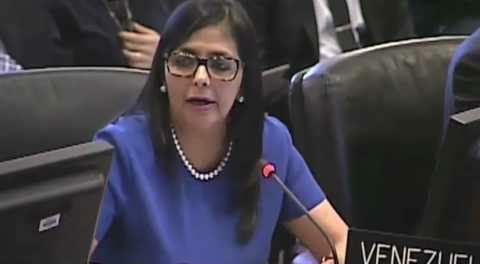 The Organization of American States (OAS) uses the impasse, already solved, between the Judicial and Citizen’s powers for two sentences on the legislative function, to force an intervention in Venezuela, denounced on Wednesday the Venezuelan Minister of Foreign Affairs, Delcy Rodríguez, during her participation in the regular session of the Permanent Council of the OAS in Washington. The Minister said that this controversy, resolved according to constitutional mechanisms, was manipulated to foment the campaign against the country and to advance in the objective of intervening and trying to guard the nation. “The OAS considered a conflict of powers in Venezuela, as it usually happens in any country, considered it as a justification to stalk and intervene our country,” she said. “It is vital to understand that conflicts between powers are part of the democratic game that are settled with the constitutional mechanisms themselves. They can not be described as ‘serious alteration of the constitutional order’, on the contrary, it must be described as what it is: a natural conflict of powers Between branches of the public power,” she said, citing 18 cases of conflict between powers in the United States, in which there was no foreign intervention. In this regard, she condemned the use of a domestic issue, which reflects the independence of powers and the strength of Venezuelan democracy, as an argument to intervene in the country. The minister said that such strategy is illegal, violating the principles of non-intervention and respect for international law, as well as a violation of the constitutional system established in Venezuela.